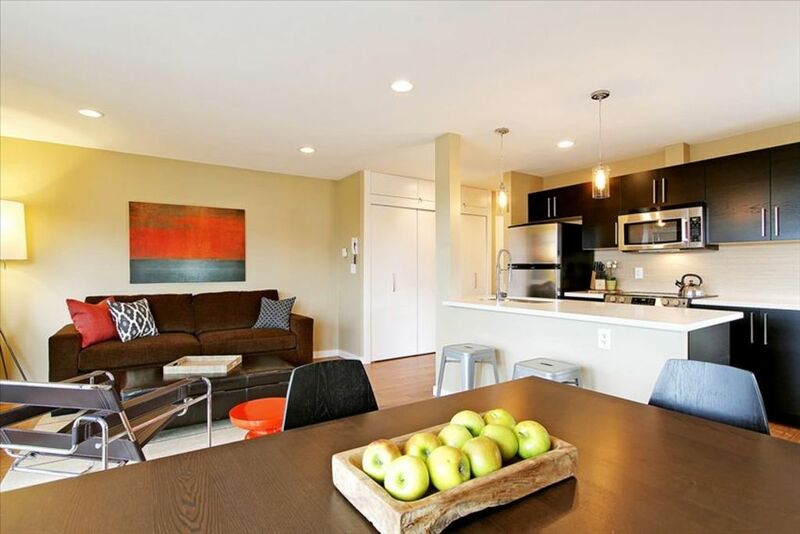 Apartamento luxuoso e completamente remodelado, na melhor localização em Capitol Hill. Este apartamento tem uma vista de Puget Sound e do horizonte de Seattle. Ele está localizado a apenas alguns quarteirões da famosa Broadway Avenue de Seattle. Com um Walkscore de 98, você não pode bater o local! O apartamento foi completamente renovado pelo aclamado designer de interiores, Michelle Tomy de Belle Projeto cinzento. Tudo é impecável, a nova marca e feito a um nível muito elevado. A roupa mais confortável e acabamentos fazer o apartamento tão luxuoso como um hotel 5 estrelas. Duas TV de tela plana a cabo de, wi-fi, livre de longa distância, uma consola de jogos Wii, moderna e nova cozinha e casa de banho. Esta é uma espaçosa, cheia de luz, apartamento de um quarto com uma cama king size e um sofá-cama queen size. A cozinha está totalmente equipada com tudo que você precisa para aqueles dias em que você não quer para jantar em qualquer um dos maravilhosos restaurantes da vizinhança. Este apartamento não irá decepcionar até os viajantes mais exigentes. Por favor, note o apartamento fica em um prédio sem elevador, onde os hóspedes devem subir um lance de escadas. Ele fica em uma tranqüila rua residencial. A localização não poderia ser melhor! O apartamento fica a poucos quarteirões da Broadway, por isso é muito fácil acesso ao centro, Eastlake, e I-5. Temos 4 todas as novas belos apartamentos disponíveis neste edifício. Palavras-chave: Capitol Hill, chique urbano, apartamento, flat, Seattle, permanece corporativos, aluguel de curto prazo, aluguer de férias, moderno, luxo, centro da cidade. Being a VRBO owner we always try to rent a from VRBO. To be honest we have had some bad luck renting in Seattle,but we now have our go to place. Visiting our son and going to the cancer center makes this place just perfect ,Located on Capital hill and only a short 10 min walk to the train station and the bus stop is just out the front door. My wife who has a small cleaning business in Big Sky Montana was just amazed at how clean the place was, and no joke she looks everywhere. If she could have stolen the cleaners she would have taken them with us. This place was a nice size and comfortable. We were within walking distance to many restaurants and transportation. The light rail from sea/tac airport was only forty minutes with about a 5-10 min walk to the apartment. Also only $3. Downtown Seattle was very easy to reach with a short light rail trip. Great place and area to stay in. It also felt safe. I loved everything about this place except for 2 minor things. The first thing you smell when you enter the apartment is the bathroom. It's definitely clean, but the bathmat and the shower curtain retain an unmistakable mildew/moldy smell. Perhaps time for new ones? The second thing is, the carbon monoxide alarm suddenly went off my first night there, screeching randomly at 3am and then at 4am. But didn't go off at all after that. It was weird. Other than that, the place was clean and comfortable and had all the basic necessities. I enjoyed my time in Seattle and the communication with Jara was quick and easy. Thanks for letting me stay! This is a nicely renovated condo in a small, old apartment building. Convenient location. We enjoyed our stay. The location is convenient to many small restaurants and there is a grocery store on Broadway that's just a few blocks away. The Capital Hill area is VERY hilly. We are vigorous walkers and we got quite a good workout climbing hills. The condo unit that we stayed in had a nice small balcony overlooking downtown. Though the weather was hot when we stayed there, August 2-6, we were comfortable with open windows and fans. There is food closet and drawer space and the open floor plan makes the kitchen/dining/living area feel spacious. Lots of natural light. Conveniently located a few blocks west of Broadway and close to the QFC for groceries and some great restaurants. Unit was comfortable and nicely decorated. Only downside was that we could hear the people upstairs walking around at times but it was not a big deal. Was able to store our luggage as our flight was after check out time which was nice. Would stay here again. Maximum occupancy is four people, including children. Smoking, parties and pets are prohibited. Three night minimum on weekends unless it's a last minute booking. Two night minimum other times. We will accept one night stays for last minute bookings or when there is only one night available. $25 fee for check ins after 10pm. Check-in is at 4pm. Early check-ins MAY be possible when asked in advance. Check-out is at 11am, no exceptions. All guests must be at least 25 years old unless accompanied by an adult. Reservations cancelled at least 60 days prior to arrival will be 100% refunded. For reservations cancelled less than 60 days prior to arrival, 75% of all payments made will be refunded for any of the dates we are able to book with alternative renters. If we are not able to book any of the dates with alternative renters, only the cleaning fee will be refunded.